Aloe – the plant of immortality is a magical herb. It is good for your skin, hair and overall health. You can apply aloe vera on skin to degrease oily skin, cure pimples, acne, skin whitening and to deal with other types of skin related issues like skin irritation. Aloe vera can also be applied on hair to cure dandruff and fight hair fall. It can also be used as a conditioner to nourish the scalp and moisturize the hair. Aloe vera is being used like a herbal medicine in various types of soaps, shampoo and other skin and hair care products. But the best thing about aloe vera is that you can just extract its pulp and apply it on your skin, face and even make aloe vera juice which is very healthy and nutritious. But to today in this post, I want to discuss about how to use aloe vera on skin and hair to get maximum benefits from this magical herb, and how to extract aloe vera pulp from aloe leaves. Aloe vera is being used as a medicinal herb from centuries, especially for skin care and hair care. Benefits of aloe vera is not just limited to skin and hair, but it’s also beneficial for your overall health. If you drink about 20 ml of aloe vera juice every day, it will boost your immune system, improve your digestion and cure many other stomach related issues. As researchers unveil about various health benefits of aloe, especially for skin and hair, it’s becoming very popular. People are consider using this alternative medicine to treat various health, skin and hair related issues. 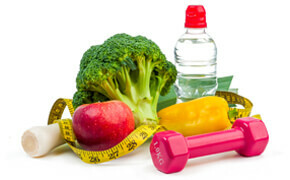 We receive many types of questions related to its uses and benefits, and hence this post. There is no doubt that aloe vera when applied correctly can have magic effect on your skin, hair and overall health and well being, and that is what, we are going to discuss it in this post. If you have any question or wish to know how to use aloe vera on skin and hair to get maximum benefits then continue reading. 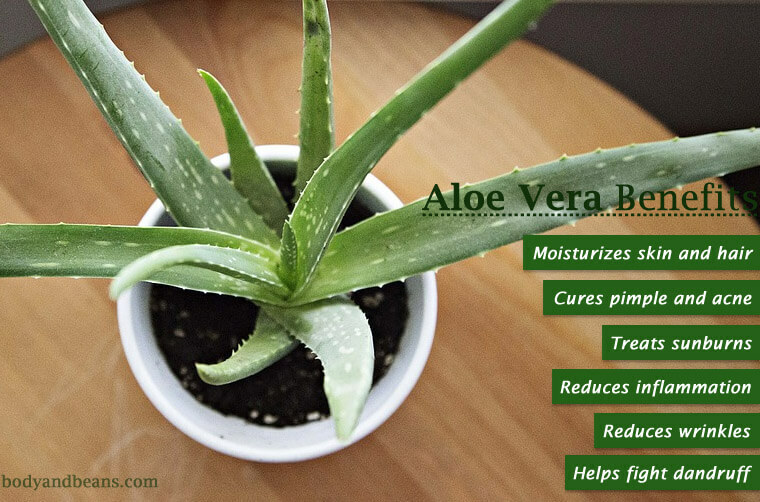 Aloe vera is a medicinal herb that can be grown in your backyard or balcony. Even if the fully healthy plant can grow up to 3 feet in height, it’s worth it, for it has many medicinal properties. Aloe vera has been used medicinally from centuries. It is such an amazing herb that can be used both internally and externally. Aloe vera can be used in many ways; you can apply freshly extracted aloe vera gel or pulp on your skin and hair or drink aloe vera juice for other health benefits. There are so many benefits of aloe vera that writing an entire book will be appropriate. But for today’s post, let’s stay focused on various health benefits of aloe vera for skin and hair, and how to use and apply this magical herb to get maximum benefits. Aloe vera contains various types of hormones including Auxin and Gibberellins, which has anti inflammatory and wound healing properties. Due to these hormones, aloe vera offer relief from skin inflammation and soothes irritating skin. Apart from the basic skin related issues, aloe extract can be used to cure chronic skin diseases like eczema and skin ulcers. Aloe vera contains above 250 enzymes and nutrients and obviously its a million dollar herb. Aloe vera gel or extracts can be applied on face to treat common skin issues like pimples and acne. Pimples and acne are the most common skin problem, which may be caused by the hormonal changes, stress, unhealthy eating or due to other reasons. Aloe vera contains various types of enzymes and hormones that help curing many skin related issues. Gibberellins and polysaccharides which are found in aloe vera have antibacterial and anti-inflammatory properties. Aloe vera also contains Vitamin C, Vitamin E and Zinc, carbohydrates and amino acids. When applied correctly on your face, aloe vera does wonder to your skin. You can create different types of face packs that can be applied on your face to get rid of most of the issues including pimples and acne. We all know about anti-inflammatory, anti-bacterial and healing properties of aloe vera. But how do we use it on our face or other body part and skin for maximum benefits? Well, aloe vera can be used in its pure form, or you can combine it with other ingredients to make different types of face packs. Depending on the skin related issue you want to cure, you can mix different types of ingredients and make home based remedies using aloe. In order to cure pimples and acne, you can simply apply aloe extract in its purest form, without mixing any other ingredient. It’s better use pure and fresh aloe vera extract, and if you don’t have the plant in your home or can’t find aloe vera leaves, you may use aloe vera extract or gel available in the cosmetic shop. Try to use something natural, though. If you don’t want to apply and leave it overnight, then you can apply the pure and fresh aloe vera gel or pulp and wash it within half an hour with soft cotton towel. You can keep applying it on your kin for a few weeks to get the maximum benefits. Precaution: The only precaution required is to not expose your skin to sun after applying aloe vera gel or extract. If you are applying it overnight, make sure to wash it off first thing in the morning. 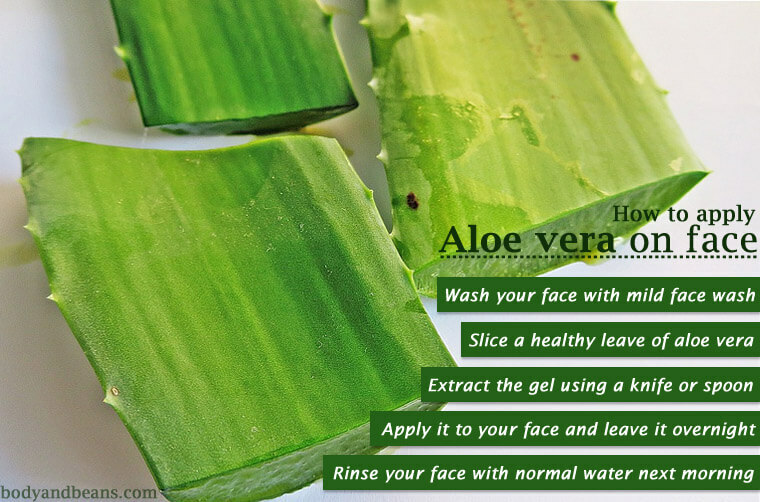 You can also make aloe vera decoction to apply on your face and here how to make it. You can use this decoction to wipe your skin twice everyday to get maximum benefits. Both honey and turmeric have anti inflammatory, antiseptic and antibacterial properties and when you make a pack by adding it to aloe vera, it does wonder to your skin. Here how to make a pack with honey, aloe vera and turmeric. But can aloe vera be used on face for fairness or to brighten the skin? Beauty has got nothing to do with the skin tone and skin colour. But due to excessive stress, exposure to direct sun, pigmentation, skin irritation and various other environmental factors, skin tone become uneven and dark. But can you use aloe vera for skin whitening? Is it really possible to get whiter skin tone by using aloe vera? Well, aloe vera does not turn your skin tone and make you white, but for sure, it fixes the pigmentation and other skin related issue to brighten and restore the original and lighter shade of the skin. Aloe vera contains enzymes and vitamins which is vital for the skin. It nourishes and moisturizes your skin cells and reverses the bad effects that may have cause darkness. When applied continuously for a few weeks (10-12 weeks), aloe vera can actually brighten your skin. It will not completely make you x tone whiter, but for you’re the glow will be evident. Using this mask continuously for a few weeks will not only cure pimple and acne, but it will also brighten your skin. You can make another face mask which is known to brighten and glow your face. Aloe vera and milk mask can soothe your skin and also brighten it up. This mask does wonder to your skin. It brightens your skin, moisturizes it and also helps you get rid of pimples and acne. Aloe vera gel and extracts are already available in the market. But give the popularity of aloe vera, it’s always better to plant it on your own. When you use aloe vera from your own garden, you are sure that it is fresh. But if you don’t have a plant indoor, you can easily source aloe vera from the market. Aloe vera gel can be made at home and it is very easy to extract aloe gel from the aloe vera leaves and here’s how you can make it. Take a couple of fresh aloe vera leaves. Slice about 3-4 inches from the top of the leave (narrow side) and leave it. A yellow and sticky stuff will be released; we are not supposed to use this yellow substance. Wipe off the aloe leave to remove the yellowish sticky stuff. Now peel off the green part to extract the aloe pulp or you may take a spoon and try to extract the pulp from the aloe leaves. Peeling off the green parts, leave you with pure pulp and it comparatively easier. This whitish aloe vera pulp can be blended in blender to make gel or can be used as per your need. Remember to use fresh leaves from healthy and properly grown aloe vera plant. Ideally, using aloe vera plants older than 3 years are best. If you want to consume it internally, then consume it the instantly, keeping it for a while in open and then consuming is not advised. But you can apply it on your skin and hair as per your needs. Aloe vera can be used on your hair as a conditioner to get healthy and glowing hair. Not only it cleanses your scalp and hair, but it conditions your hair as well. There are special enzymes in aloe vera that destroys the excessive dead skin cells and fungus which may cause dandruff and hair fall. It can unclog your follicles and offer nutrients which are required for hair growth. Aloe vera can be used to make various types of conditioner and shampoo that promotes hair growth and help you to fight hair fall. Aloe vera does not have any side effects (for most of us) and you can apply fresh aloe gel on your scalp to fight hair fall, dandruff, dryness and many other hair related issues. You can apply pure aloe vera gel or mix it with other ingredients like water, lemon, and essential oil to make natural home conditioner and shampoo. You can simply use fresh aloe extract or gel and use it like the usual conditioner and wash it to get soft and shiny hair. Just make sure to wash your hair properly and get rid of the sticky bit. Take one quarter cup of aloe vera gel and add juice of about half a lemon. You can apply this conditioner after shampooing your hair. Ideally you should leave it for in 5-10 minutes and then rinse to get maximum benefits. Make aloe vera and olive oil deep conditioner by mixing equal quantity of both freshly extracted aloe vera gel and olive oil. Apply this conditioner to your hair, and rinse after about half an hour to get healthy and shiny hair. Aloe vera is a magical herb which can be applied on face, skin and hair. Aloe vera extract can be applied to get healthy and glowing skin and also as a hair conditioner to soften and moisturize hair. It contain a number of nutrients and enzymes and has anti inflammatory and antibacterial properties. Use aloe vera on your skin in its purest form, or make face pack or conditioner for your hair, aloe vera can seriously benefit your skin and hair. The only precaution that you need to take it to make sure to not expose your skin to sun, after applying aloe vera gel. And avoid using aloe vera while breastfeeding or during pregnancy. Have you used aloe on your skin or hair? How was the experience, did you realized the evident benefits on your skin or hair?